This Orange Vanilla Bundt Cake is moist, flavorful and infused with orange zest! 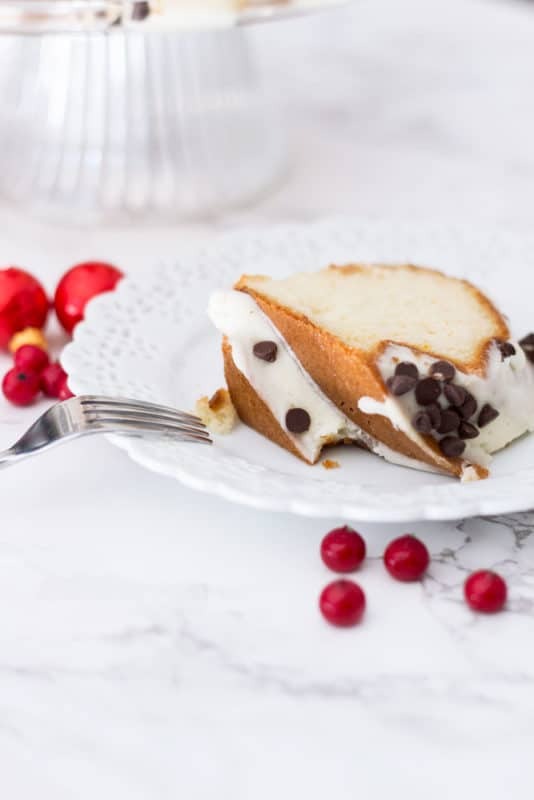 Top this cake with a quick and easy vanilla frosting and sprinkle on those mini chocolate chips! 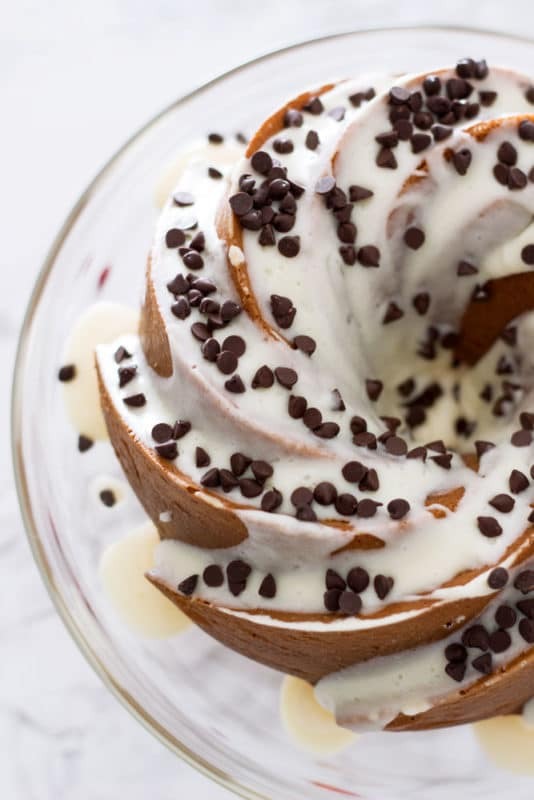 It’s a total crowd pleaser and such a pretty bundt cake. I even provide you with a gluten free version! Cake is a weakness of mine….kinda like it is with Moose Finbar in Jumanji: Welcome to the Jungle. Except I don’t blow up and die like he does. Just sayin. But seriously, cake and I have an amazing relationship. We love each other, like a lot. 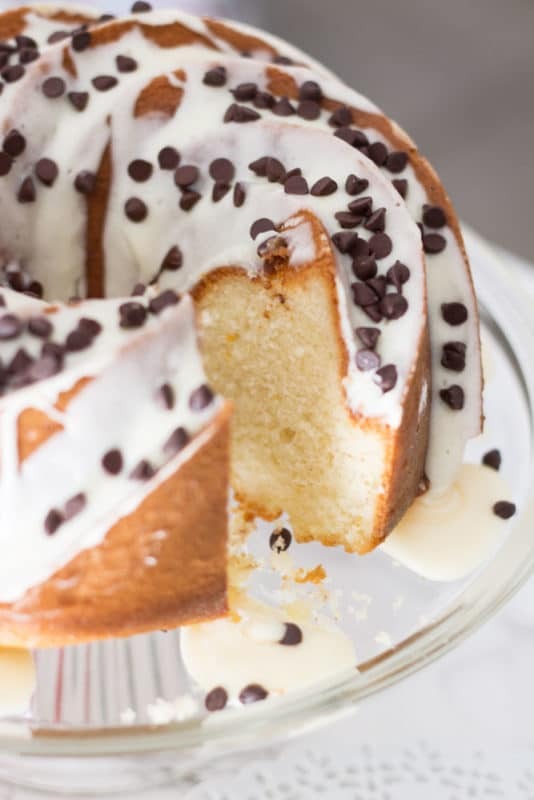 And this Orange Vanilla Bundt Cake is one of my absolute favorite cake recipes ever! Actually, this cake is originally referred to as Bizcocho de Naranja. Remember that lunch coop I told you I was a part of at my office? Oh…yes you do…remember when I posted this Hubbard Squash Soup and these Southwest Meatballs. Yeah, I knew you would remember! Yeah you! Well, this Orange Vanilla Cake (my new name for it) came from that lunch coop and oh my goodness…it’s amazing. Diego made this cake and he’s from Spain. His recipe is called “Bizcocho de Naranja” and it’s a simple classic Spanish recipe. He brought this cake to lunch coop and we all loved it! It’s crazy moist and super flavorful. So I asked him for the recipe and he gave it to me. But I switched it up just a little bit because well, that’s what I like to do! So how did I change it up exactly? A couple of ways actually. For one, I made a gluten free version of Bizcocho de Naranja. When Diego brought this into the lunch coop, he had it in a 9×13 cake pan with no frosting and served it with vanilla ice cream instead. 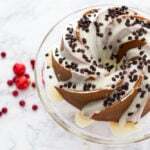 I wanted to turn this into a bundt cake and add a cream cheese frosting and THEN add the mini chocolate chips on top! And I didn’t serve this one with vanilla ice cream but I totally could have! Frosting and ice cream go so well together! So pretty, right? I LOVE this mold! 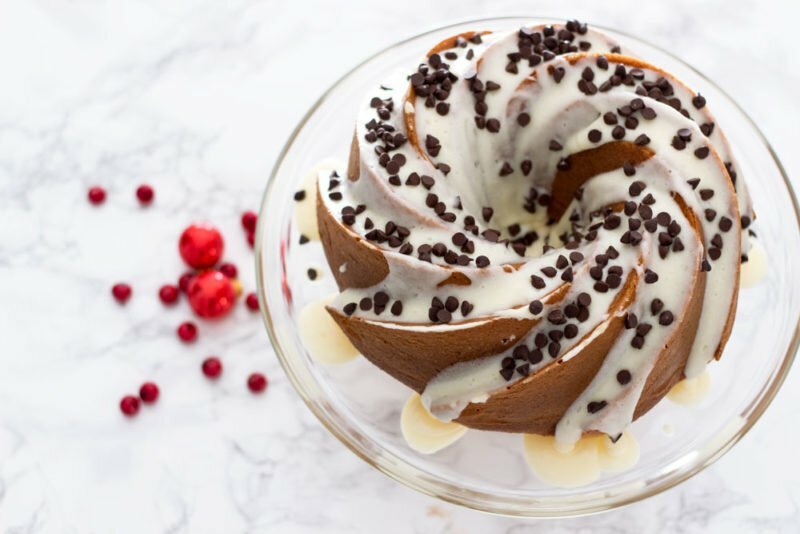 This bundt mold is called the Nordic Ware Platinum Collection Heritage Bundt Pan and it’s so easy to bake with….I’m talking a clean release from the mold! No crumbles or breaks in my cake! So back to Diego and this Bizcocho de Naranja which I’m now calling Orange Vanilla Bundt Cake. The cake calls for simple ingredients that you have in your kitchen. What makes this cake POP is the almond extract (I totally added this extra ingredient) and the fresh orange. Oh and those mini chocolate chips on top of that cream cheese frosting. Huge shout out to mini chocolate chips! I get a little heavy handed when it comes to adding on that cream cheese frosting. I think frosting should freely drip so that I can eat it with my fork. And there is nothing wrong with doing that. No judging here. Especially when it comes to cake….and frosting! I do also like to eat my cake like the rest of the world and actually slice me a piece. And put it on a plate. Sometimes…,although that’s not always required. This Orange Vanilla Bundt Cake is good for breakfast with my latte. It’s also good for a snack before lunch, with another latte. Sometimes, it’s perfect for lunch and it’s ALWAYS perfect at night after dinner when I’m in my jammies on my couch wearing my fuzzy socks with a glass of milk. And don’t be fooled…this is a small slice. I’ve been known to eat up to 3 slices of this cake a night. It’s ok, because there’s no judging here. This is a safe place! When it’s that good you eat it and you enjoy every single bite! Shout out to Diego for sharing his cake recipe! In honor of Diego’s traditional recipe, I put his original version in the notes section of the recipe card. 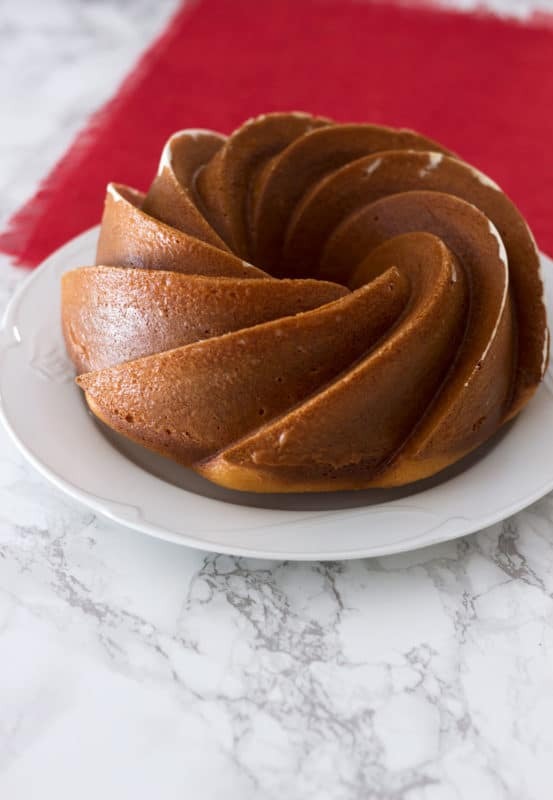 And don’t worry…if you don’t have this bundt mold, you can use a regular 9×13 cake pan, like this one here. And I do highly recommend serving this cake with vanilla ice cream. The vanilla ice cream and orange in this cake pair beautifully! 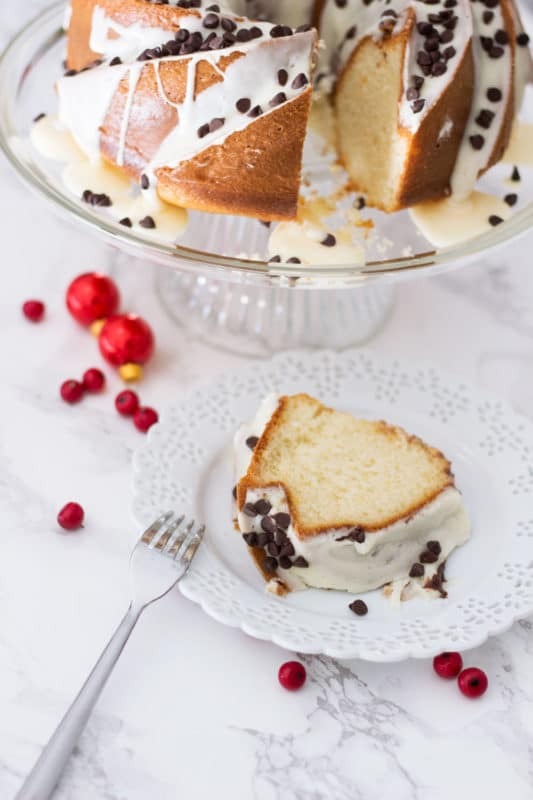 Oh – and if you’re gluten free, you can totally make a gluten free version of this cake! And yep, I tell you how in the recipe card below. Enjoy my friends and happy sweet eats with this cake. For all my Spanish friends, Disfruta este pastel! This Orange Vanilla Bundt Cake is moist, flavorful and infused with orange zest! 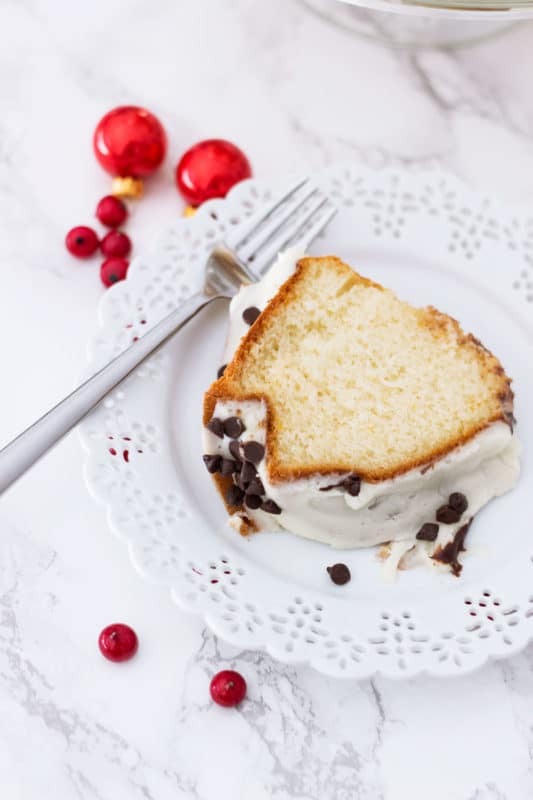 Top this cake with a quick and easy vanilla frosting and sprinkle on those mini chocolate chips! 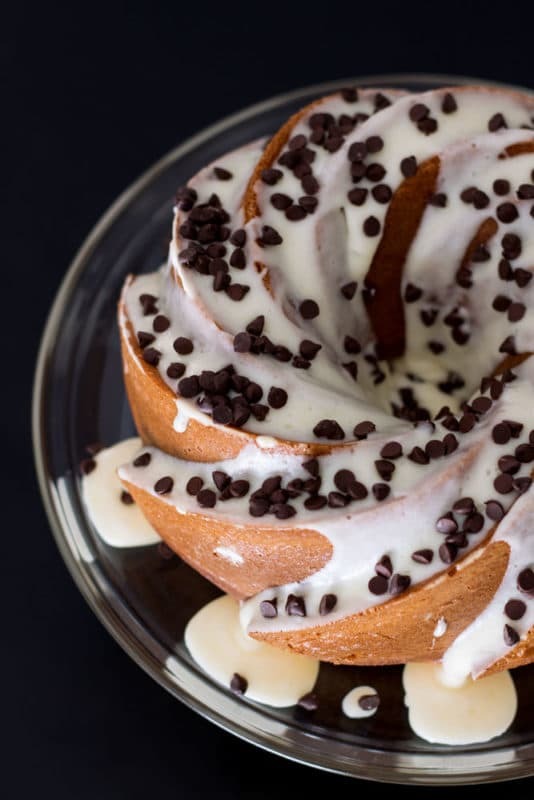 It's a total crowd pleaser and such a pretty bundt cake. I even provide you with a gluten free version! In a standing mixer, blend for 3 minutes the sugar, the orange (cut in super small pieces with the peel, don't peel it!) and the 3 eggs at mid-high speed. Add the almond extract, softened butter, Canola Oil and Greek yogurt and mix for 45 seconds at a low-medium speed. Add the remaining ingredients (except the frosting and mini chocolate chips) and mix for 20 seconds at low-medium speed. Prepare a bundt pan or a 9x13 cake pan with some butter and flour to ensure no sticking occurs. 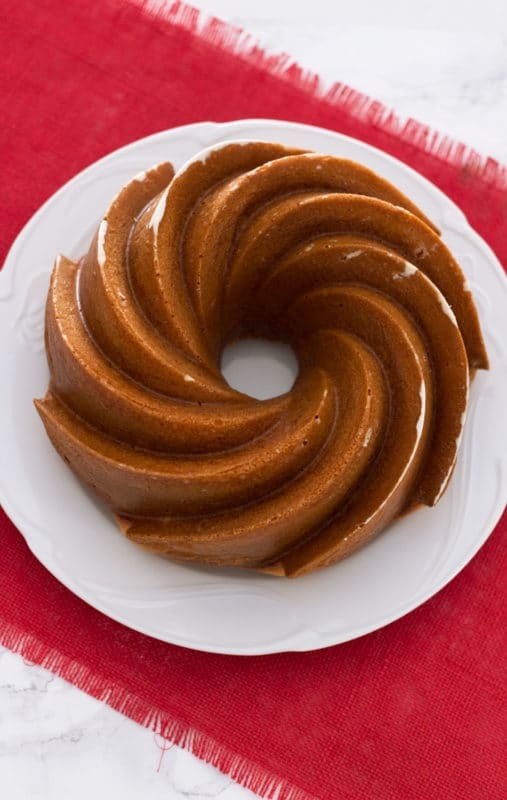 If you are using a bundt mold, you want to ensure the dish is coated well so no sticking and crumbles occur. Pour half the mix into the pan. Next, add half the chocolate chips into the wet mixture. Place your pan into the oven and bake for 38-40 minutes if using a cake pan. If using the bundt pan, it will take about 45-50 minutes to cook. You'll know it's done when a toothpick placed into the cake comes out clean and the cake turns a nice golden color. If you want Diego's Spanish version exactly how he prepares this cake, here it is! a little amount of salt. 1. Blend for 3 minutes the sugar, the orange (cut in pieces with the peel, don't peel it!) and the 3 eggs at mid-high speed. 4. Prepare a baking recipient with some butter or flour. Put the mix on it (until it fills 50% of the height). You can add some chocolate chips during the proccess. Add some gran sugar and more chips on top. 5. Introduce in the pre-heated ove to 350F (180C) for 25 minutes. Let's talk about using yeast for a minute. My daughter is allergic to yeast so I substitute out the yeast and use 1 Tablespoon of baking powder! Easy Peasy! 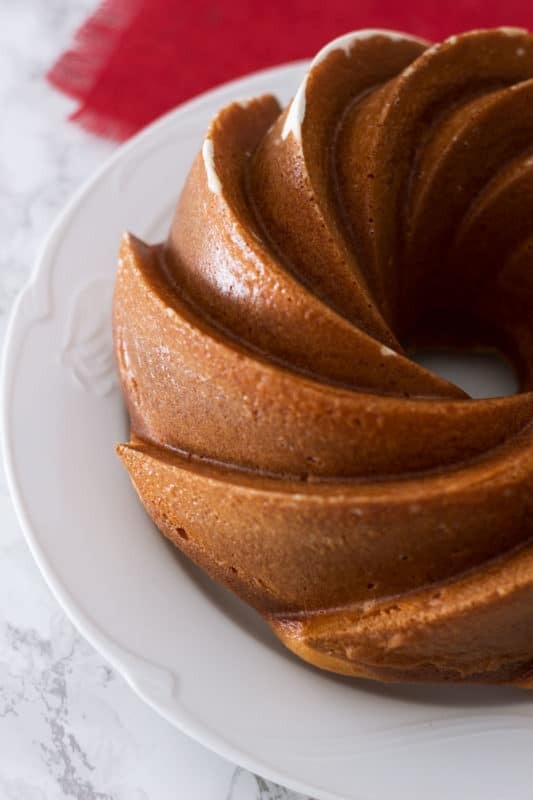 Don’t forget to pin this ORANGE VANILLA BUNDT CAKE to your favorite DESSERT and CAKE board on PINTEREST!! What a lovely looking cake with so many delicious flavors!